WASHINGTON, D.C. -- As the Affordable Care Act's deadline for getting health insurance approaches, 30% of U.S. adults still say that they, or a family member, have put off medical treatment in the past year because of the cost. This figure has been stable since 2005, but is higher than it was between 2001 and 2004. Uninsured Americans are more than twice as likely as those who have Medicare, Medicaid, or private insurance to say they put off medical treatment. Fifty-nine percent of the uninsured have done so, compared with roughly one-quarter of those with Medicare or Medicaid (22%) or private health insurance (25%). Additionally, younger Americans aged 18 to 29 and lower-income Americans -- two groups that are the least likely to have health coverage -- are significantly more likely to have put off treatment than their older and higher-income counterparts. A provision of the Affordable Care Act, also known as "Obamacare," that takes effect in 2014 requires most Americans to get insurance or pay a fine. Most uninsured Americans say they plan to get insurance, which is likely to reduce the percentage who put off medical treatment. 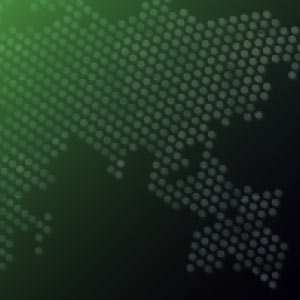 But about one in four Americans who currently have insurance still put off treatment, so increasing the percentage who are insured should help reduce, although it likely won't eliminate, Americans' forgoing medical treatment for cost reasons. 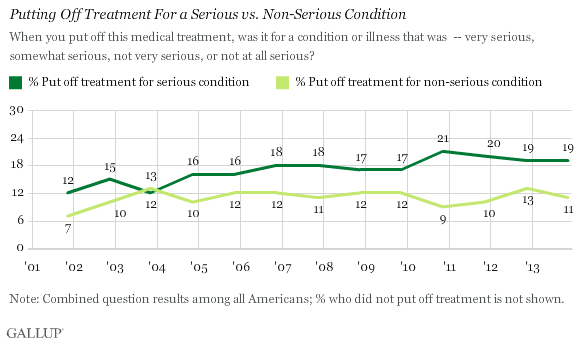 Americans overall are more likely to put off medical treatment for a serious condition than a non-serious one, which generally has been the case since Gallup began asking this question annually in 2001. The percentage of Americans putting off treatment for a serious condition because of cost has increased since the early 2000s, while the percentage putting it off for a non-serious condition has barely budged. Americans named cost as the most urgent health problem in the nation this year, with more citing this issue than access, obesity, and cancer. 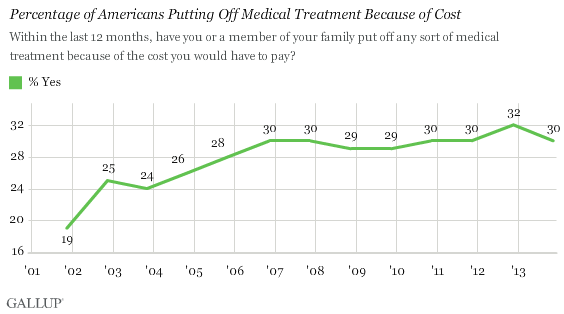 Healthcare costs also remain a significant problem for individuals: a higher percentage of Americans now say they put off medical treatment because of cost than did so in the early 2000s. One possible explanation for the higher numbers since then is the increase in the number of high-deductible plans. Americans with serious conditions who have insurance may be putting off treatment to avoid high out-of-pocket costs. If the Affordable Care Act -- which is designed to ensure that all Americans have affordable health coverage -- works as intended, fewer Americans should need to put off getting necessary medical treatment because of cost. This could positively affect individuals' personal health situations and workplace productivity. At the same time, the possible uptick in the number of Americans seeking medical treatment may put additional strain on the healthcare system, creating new problems. Twenty-eight percent of uninsured Americans say they are more likely to pay the fine for not having health insurance than to obtain insurance, as required by the healthcare law. Politics appear to be a major factor in that decision.